Live the Message! Be the Messenger! 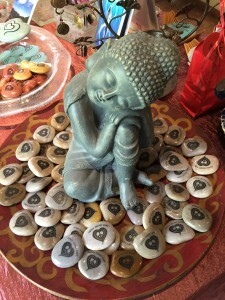 Part of the Peace Starts Here invitation is to spread the concept…that peace begins within. 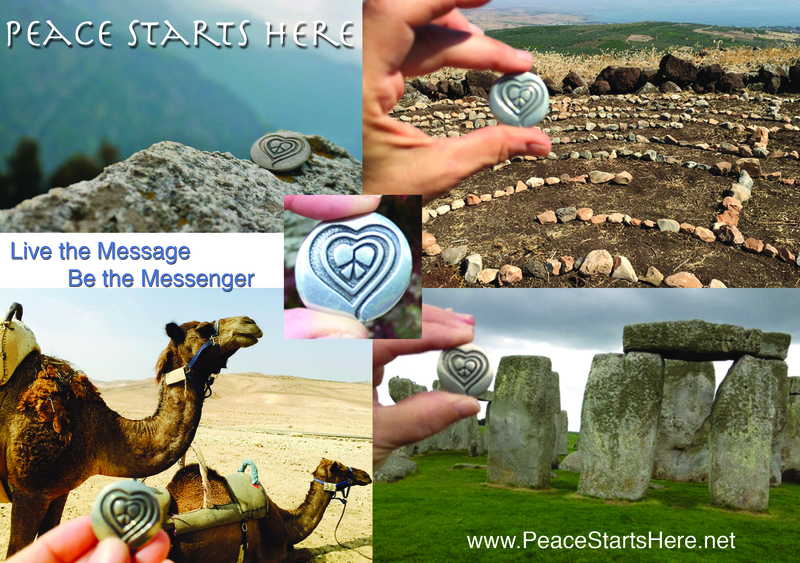 You can certainly create your own symbols and messages for sharing this, however we have created some products to assist you in stating that you are a Peace Messenger! 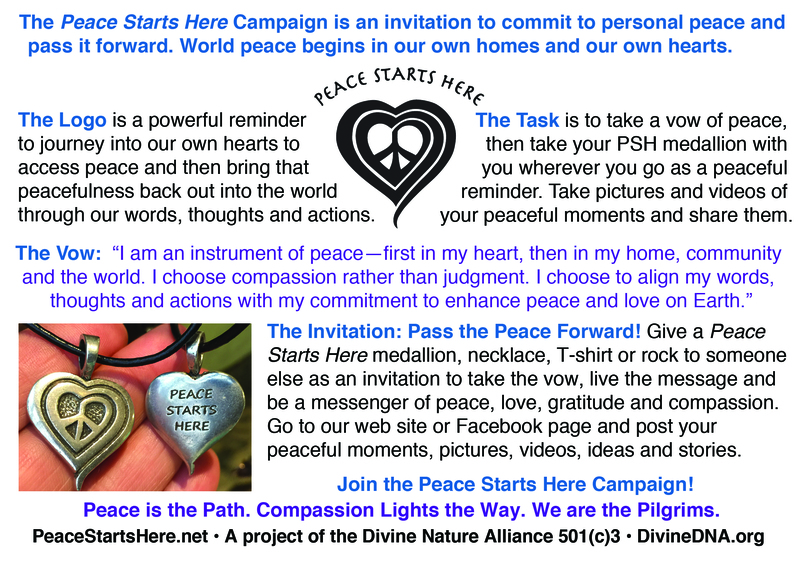 The Peace Starts Here campaign is sponsored by the Divine Nature Alliance, a 501(c)3, and all proceeds support the creation of peaceful environments, peace education and products to support peace. PLEASE NOTE THAT SHIPPING PRICES ARE FOR THE US. If you are in another country, shipping will be calculated and billed separately (you will have the right to decline and receive refund if shipping is too high). Peace Starts Here Medallions are $6 each and come with a postcard explaining the mission. We encourage you to buy them in multiples so you can Pass the Peace Forward! So we have multiple medallion discounts. (Please note, if you click on the wrong button for the quantity you desire, you will be charged the wrong amount and thus adjustments will need to be made prior to shipping. Thank you! This “Buy Now” button is for 1-10 medallions. 11-20 Medallions + Postcards $5 each. This Buy Now button is for 11-20 medallions. This Buy Now button is for 21-50 medallions. 51+Medallions + Postcards $3 each plus shipping. 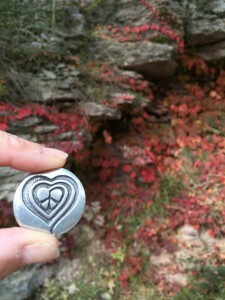 This Buy Now button is for 51+ medallions.Our supplier is super busy and may take a little while to get more in large quantities so let us know asap if you will be wanting MORE! 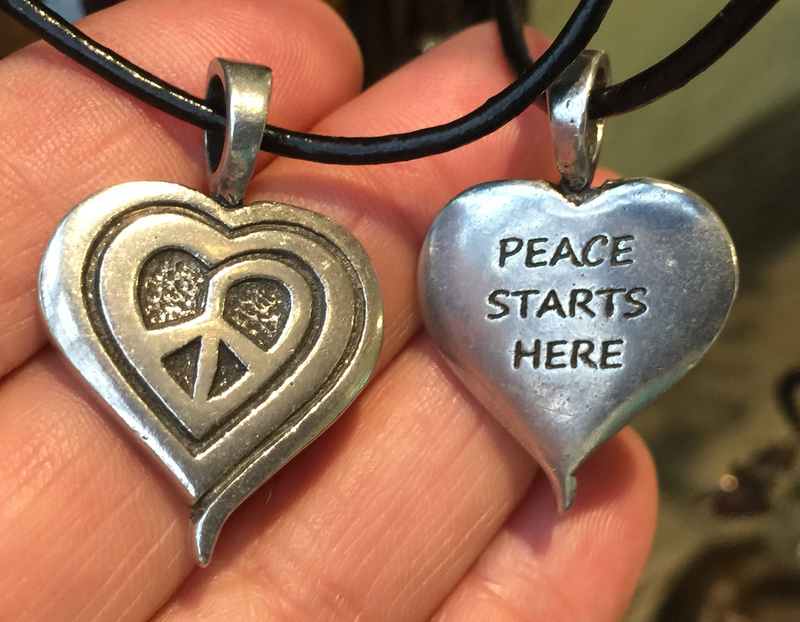 You can also retail the Peace Starts Here Medallions, but please keep in mind this movement is about the message, not about the money! 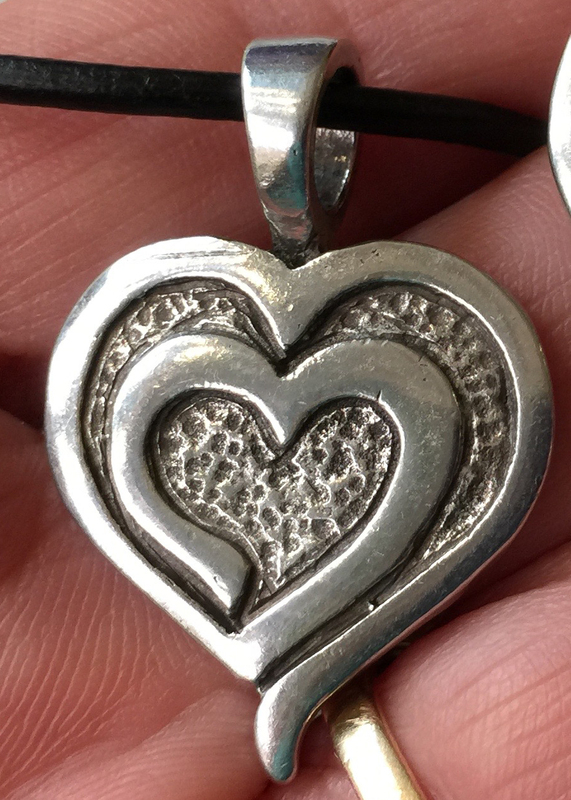 PLEASE POST YOUR PICTURES AND VIDEOS WITH YOUR MEDALLION ON OUR FACEBOOK PAGE! 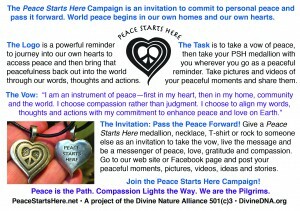 Join the Peace Starts Here Group! These also come with the postcard. Peace Starts Here Polished River Rocks! 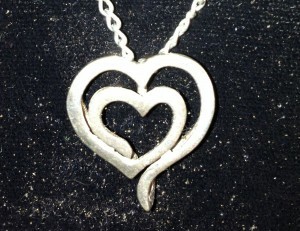 $6 each (contact us if multiples are desired). These also come with the postcard. styles, long sleeve, short sleeve). They all have the Peace Starts Here logo on them. 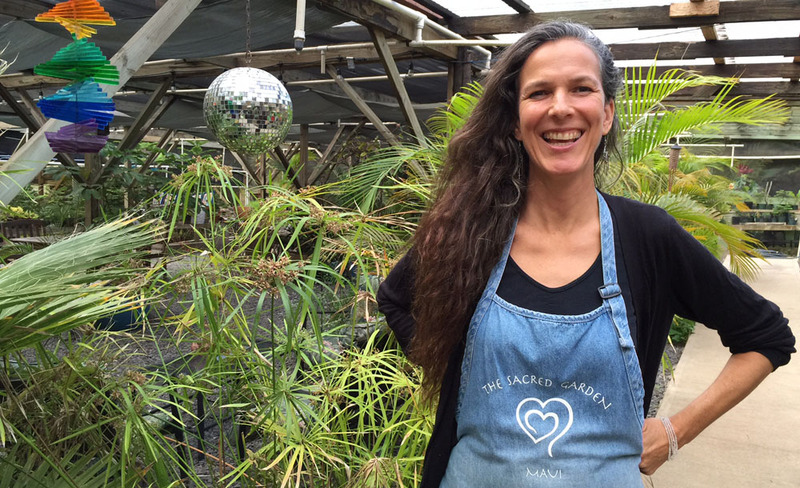 We have a variety of colors, so feel free to call The Sacred Garden and ask what is in stock. 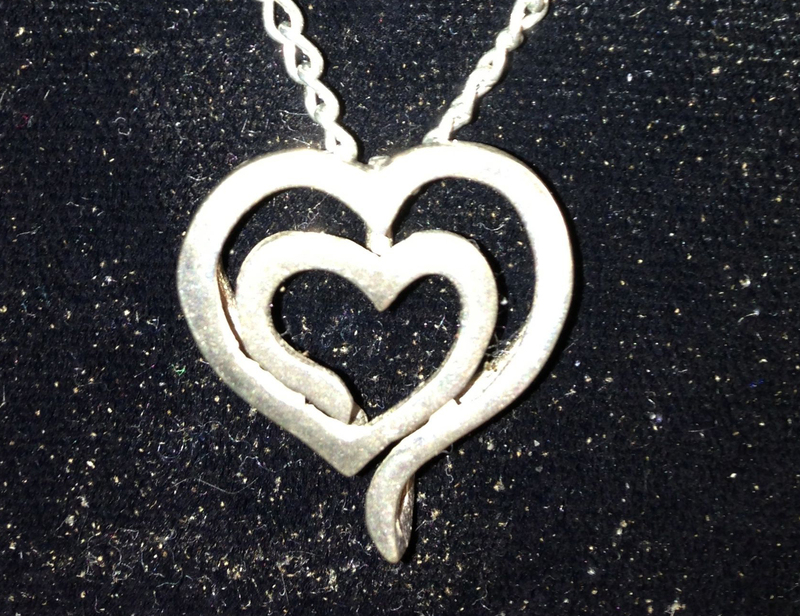 Eve’s Heart Logo is very sweet…here’s the story. These are very beautiful and have the ability to be hung in four different directions depending on your mood. 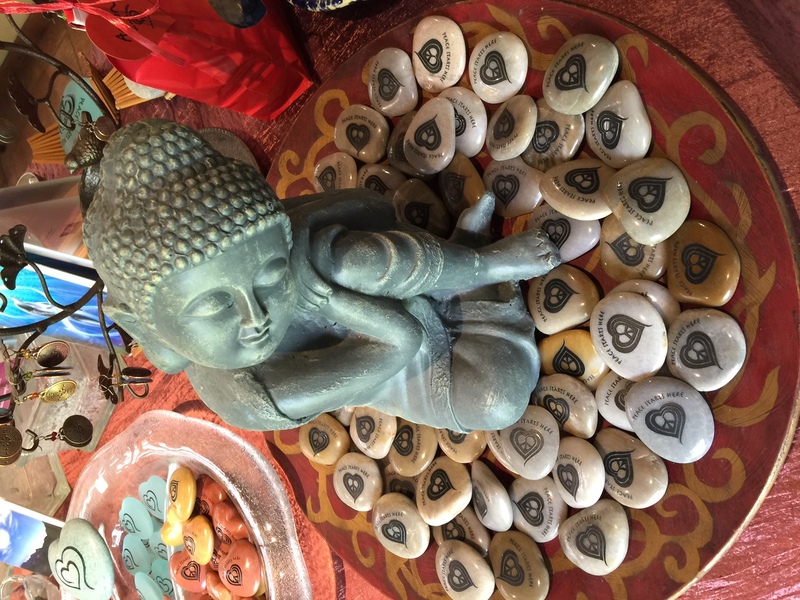 Shown below, the first is symbolic of the journey into your own heart to access love and peace and bring it back out into the world. The second direction is symbolic of an Om symbolic of God, the third is the Divine Feminine…and we will leave it to your imagination why, and the forth spells the name Eve…the mother of humanity.